Tullibardine 20 Year is a pure, perfectly aged, unadulterated bottle of Highland single-malt love. If we set out to find the oldest brewing and distilling spot in Scotland, Tullibardine would definitely be in the running. Back in the 15th century, King James IV—a young, strapping lad—made a stop at the local brewery here on the way to his coronation. Heck, wouldn't you? This is recorded as the first "official" purchase of beer in kingdom (though we think it fair to say that there were quite a few "unofficial" purchases being made at the time). The name Tullibardine means "vantage point" in Gaelic and originates from a little medieval chapel, set up in 1446 near the distillery. The old brewery was transformed into a distillery back in about 1946 and has become a solid maker of single-malt Whisky. They produce their signature 10-year, several finished "double-wood" Whiskies, and some older limited editions. The formula for producing Tullibardine 20 Year comes right out of the basics. They take their fine Highland single-malt spirit, place it gently into first-fill ex-Bourbon casks … and then wait 20 years. Seems so simple, right? I mean, why doesn’t everyone do it? While perfect distillation is an art—and we take nothing away from those master craftsman, God love ‘em! But these days the hardest part of making a great Whisky can be getting away from all of the marketing flacks and optimization Nazis who want to maximize volume and increase storage efficiency. Tullibardine 20 Year Old does exactly that… It’s a pure, perfectly aged, unadulterated bottle of Highland single-malt love. 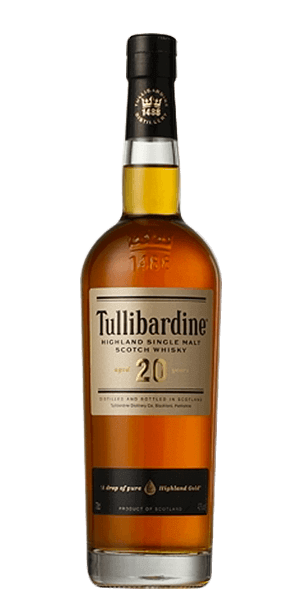 What does Tullibardine 20 Year Old taste like? The Flavor Spiral™ shows the most common flavors that you'll taste in Tullibardine 20 Year Old and gives you a chance to have a taste of it before actually tasting it. Chocolate truffles, sweet cream, and spice. Vanilla, creamy oatmeal, and allspice. Honest? Tastes like monkey urine.